The British economy received a boost from an unlikely source. 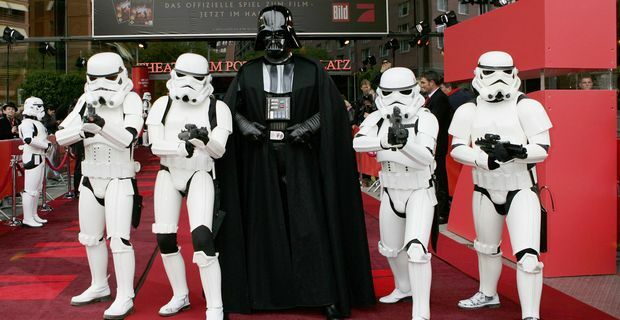 The next Star Wars film will be made in the UK, producers Lucasfilms announced. Chancellor George Osborne was delighted by the news. Production will begin in 2014 with a 2015 release date planned. It's a return to its UK roots for Star Wars. The first films used UK studios like Elstree and Shepperton to create the immensely popular space adventures. Kathleen Kennedy, the president Of Lucasfilm, said: "We've devoted serious time and attention to revisiting the origins of Star Wars as inspiration for our process on the new movie, and I'm thrilled that returning to the UK for production and utilising the incredible talent there can be a part of that." Part of the "incredible talent" on previous productions was Warwick Davis, an Ewok in Return of The Jedi. He welcomed the move. "I think that it's Star Wars coming back to its roots," he said. "It's where it started all those years ago in 1976. It's really where Star Wars was kind of born and it's nice that it's coming back." The new film will be directed by JJ Abrams, the mastermind behind the successful reboot of the Star Trek franchise. The three prequels to the 70s hits were widely criticised, but Abrams seems to have a gift for reinventing familiar source material. It is intriguing that the producers met with Osborne before agreeing to make the films in the UK, presumably discussing the tax breaks that would help production. "I think it is a real vote of confidence in Britain's creative industries," Osborne said. "A big movie like that - one of the most famous, perhaps the most famous movie franchise in the world - brings with it not just jobs for actors and directors and so on, but for all the other people who have put together an enormous movie."